The Pampas of South America are a grassland biome. They are flat, fertile plains that covers an area of 300,000 sq. miles or 777,000 square kilometers, from the Atlantic Ocean to the Andes Mountains. It is found primarily in Argentina and extends into Uruguay. The word Pampas comes from the Guarani Indian word for level plain. The Argentinean Pampas are the home of the 'Gaucho', the original South American cowboy. The pampas is located just below Buenos Aires, between 34° and 30° south latitude, and 57° and 63° west latitude. The average temperature in the Pampas is 18° C. The pampas has a 'high sun' or dry season in the summer, which in the Southern Hemisphere is in December. The wind blows most of the time. The climate in the pampas is humid and warm. There are many kinds of animal and plant life in the Pampas. Native plants and animals on the Pampas have made adaptations to living in a windy grassland. Many animals browse on grass or burrow in the ground. There is even an owl that builds its nest in underground burrows. A few of the plants in the pampas include cattails, water lillies, reeds. These plants usually prefer wetlands but they have adapted to the dryer Pampas grasslands. There are not very many trees because fires frequently occur in the pampas. The fires do not kill the grasses, which regenerate from their root crowns, but destroy the trees, which have shallow root systems. The exception is the Ombu which has made adaptations to protect itself from fires. Some animals include seed eating birds such as the Double Collard Seedeater, the great Pampas Finch, the grassland Yellow Finch, and the Long Tailed Reed Finch. It is also home to the Greater Rhea, a relative of the African Ostrich and the Australian Emu. In addition to birds, several interesting mammals can be found in the pampas. The Geoffroy's Cat, for example, with its gray coat and black stripped legs, is almost invisible in the mesquite and bunchgrass. The Maned Wolf has very long legs so it can see over the tall grasses. Also, one can find a llama-like Guanaco that lingers among the ponds. It is important to know that at least fifteen mammal species, twenty bird species, and fifteen plant species are at serious risk of extinction in the Pampas. The humid Pampas ecosystem is one of the richest grazing areas in the world. Because of its temperate climate and rich, deep soil, most of the Pampas has been cultivated and turned into croplands. 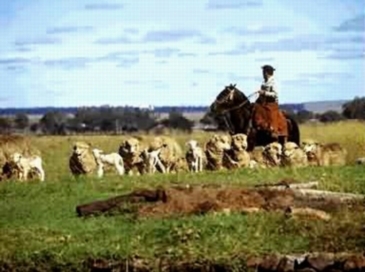 Unfortunately, domestic livestock and farming have severely affected the pampas. Fertilizers and overgrazing are a serious threat to the pampas. There are only a very few pristine remnants of the legendary "ocean of grass" that was the Pampas. It is considered to be one of the most endangered habitats on earth.